My oldest daughter is a Tax Collector's servant. She's been working in Bethlehem all weekend. Actually she's taking part in an Interactive Living Nativity that goes for three nights this weekend. Observers (that's us, the general public) get to experience a little bit of authentic "Christmas" as they walk through the 'town' of Bethlehem - wander among market stalls, pet live camels, donkeys, sheep and interact with about 60 people dressed and acting in character as townsfolk, the Innkeeper, Roman Soldiers, fishermen, shepherds, a tax collector, Rabbis, wisemen, children. 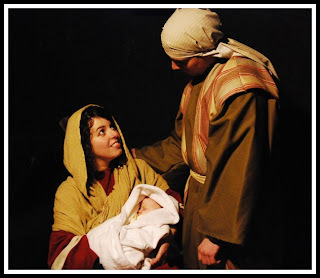 At the end of the walk-thru, you come to the stable with Mary, Joseph and the Christ Child. It's all outdoors, at night in the cold (how authentic! ), but fortunately everyone's pretty well wrapped up under those robes. 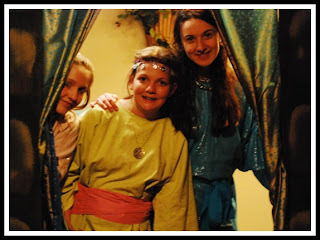 My other two daughters LOVED it too of course and we walked thru many times. It's a beautiful, powerful and well done rendition of the Nativity - as well as huge production that I am amazed by, but glad it's one thing this season I'm not in charge of!! 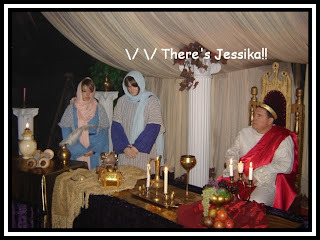 My Jessika is one of the Tax Collector's servant girls and in her 'role' she fusses around his tent while he collects taxes from those entering Bethlehem. Not really a big role, but she's absolutely LOVING it. The cold weather and long hours of basically just standing while people walk by don't seem to phase her at all - and she still has Sunday night to go as well! 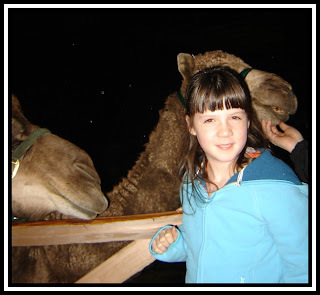 I'm proud of her though, it's not an easy way for anyone, let alone a restless teenager, to spend four evenings. 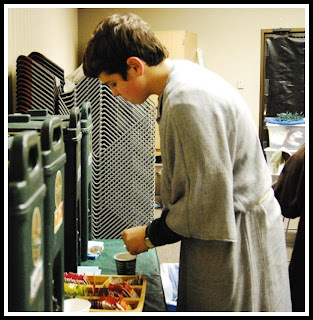 The cast and crew are kept warm and fed by a hidden staff of more volunteers who keep soups, coffee, cocoa and cider available for quick snacks behind the scenes. Knowing that there were several other vegetarians/vegans in the production besides my daughter, I offered to bring a big pot of vegetarian soup for part of each evenings warm-up chow. Did they have Potato-Green-Chile Chowder in Bethlehem? Maybe not 2000 years ago, but it certainly kept a few weary souls warm tonight while the story they shared warmed hundreds of onlookers hearts. Whatever your beliefs, hopefully this finds you safe, warm and sharing the Season with friends and family. 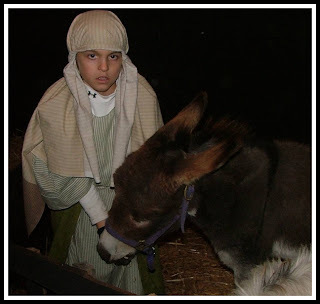 Here's my soup recipe (one of my daughter's favorites) and some pictures from the Living Nativity. Enjoy. Cube potatoes into about a 1 inch square and place in 4 quart pot. Add onion, carrots, and celery and pour in broth and add enough water to just cover the potatoes. Bring to a boil and cook for about 30 minutes. Add the remaining ingredients except for 1 cup of the soymilk and ½ cup of flour. 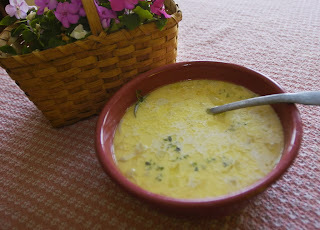 Mix the remaining milk and flour; pour into soup mixture and simmer for another thirty minutes until thickened. Add Sour Supreme and stir in. Blend partially with an immersion blender if you prefer it more smooth. This is also good with corn added! Awww, Tofu mom, that sounds so beautiful! I definitely would have gone had I been there, (and I'm not a relgious person) but it looks so well done and a whole heck of a lot of work, too! Any project that so many people pour their heart and soul into deserves a looksee. Merry Christmas to you and the sprouts! Wow, awesome nativity scene! Do they do that every year in your town? What a great way to reflect on the meaning of Christmas. I would love to see or participate in something like that. I'm definitely going to try that soup, thanks! I liked the title of your post. Thanks for the filling soup recipe. That sounds so awesome. I'm not very religious, but I'd still enjoy seeing scenes like that around town. That sounds so cool. The director for that gets major props. How fun for everyone! What an awesome experience to be a part of! Merry Christmas! I love the pageants and re-enactments around the holidays. What a nice tradition and how great that your daughter is taking part! I can see why you'd be very proud. Looks beautiful. Mmm, chowder with potatoes! :P The other ingredients don't even matter since I am sold on just that description! I made your soup last week (with the corn) and it was great! Yum, thanks for the recipe. Hey mommy! I was just going through your blog, it's fun, it makes me hungry. Anyway the picture at the bottom of this post, the one of the boy making cocoa, yeah, that's Tanner! HAHHAHAHAHAHAHAHAHAAAAA. oh wow. that's so funny.